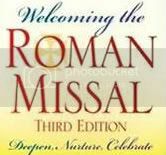 A “missal,” from the Latin word for “Mass,” is a book that contains the text (words) and rubrics (directions) for the celebration of the Sacred Liturgy. On Thanksgiving Weekend, the First Sunday of Advent, the Catholic Church in the United States will begin using the Revised Roman Missal with fresh texts for the Mass in English. This new translation has been many years in the making. It will more closely follow the words already in use for Mass in many different parts of the world, bringing us closer in union with the worldwide Church. At Queen of Angels, there will be lots of help as we make this transition together. Please click the "Understanding the Revised Mass Texts" image in the sidebar or see the items below for some thoughts on the Mass and particular changes, a series which will appear each week in “The Guide” and here on our website. Starting with the 5 p.m. Mass on Saturday, November 26, pew cards will be available on the hymnal carts in the back of church, so that you can follow along until you are comfortable praying with the new words. New hymnals and missals with a revised Order of Mass have been delivered. It will take time and effort from all of us to adapt. For more info, visit www.usccb.org/romanmissal.